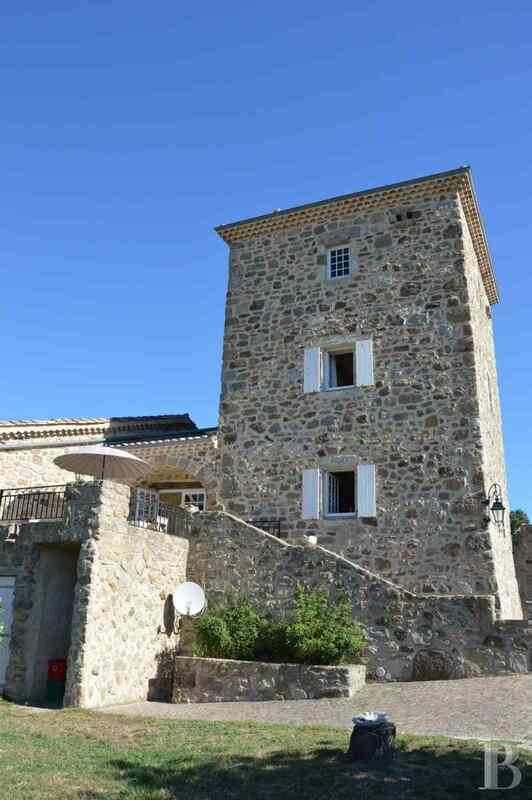 A fully renovated, 18th century tower with its bungalow and an exceptional view in the midst of an estate in rural Ardèche - character properties France - in Provence, Languedoc-Roussillon, Côte d'Azur, Upper-Savoie - Patrice Besse Castles and Mansions of France is a Paris based real-estate agency specialised in the sale of Character houses. 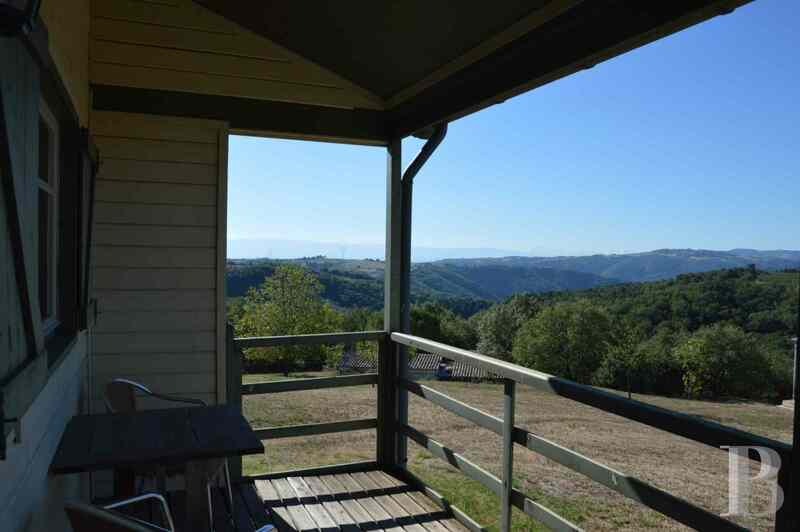 This property is set near to a village, with some 800 inhabitants, in the foothills of the French department of Ardèche. The village, steeped in history, is mentioned as of the 12th century as a stopover along the route from Le-Puy-en-Velay to Jerusalem. 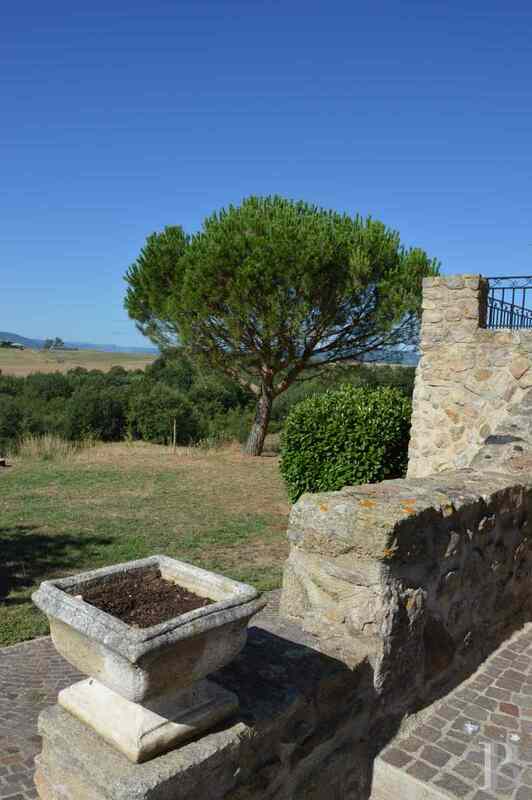 Although in the countryside and benefitting from a panoramic view, this property is but 20 minutes from Tournon-sur-Rhône and 50 minutes from Valence with its TGV train station and its 135-minute links to Paris several times a day. Lyon-St-Exupéry airport is 90 minutes away by car. 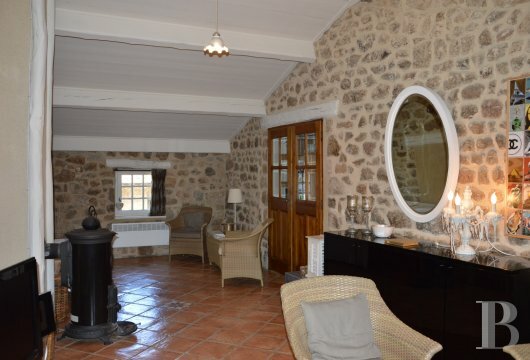 This property comprises an old tower, from an 18th century windmill, which has been fully restored and transformed into a house, spanning approx. 200 m² of living space, as well as a bungalow, spanning approx. 32 m². A horse loose box completes the property which is part of an estate, extending over approx. 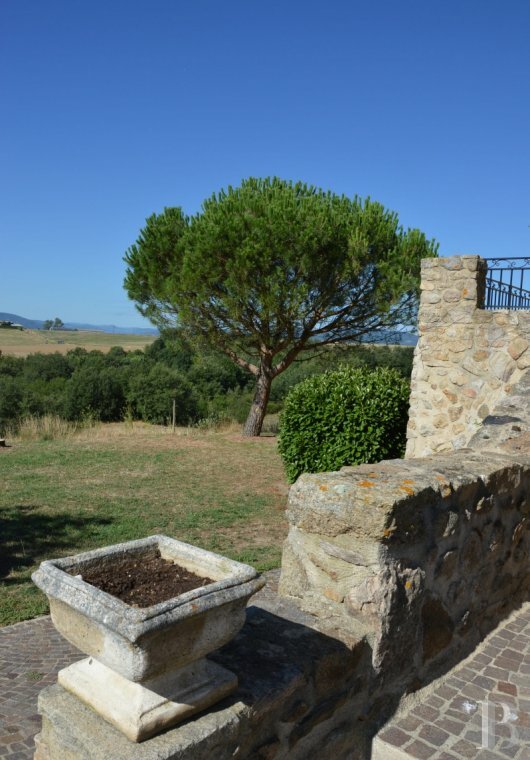 3.7 ha of co-owned land, comprising other stone houses and bungalows set amidst immaculately kept and superbly laid out green open spaces, together with a swimming pool and a patio, where a Provencal atmosphere reigns. 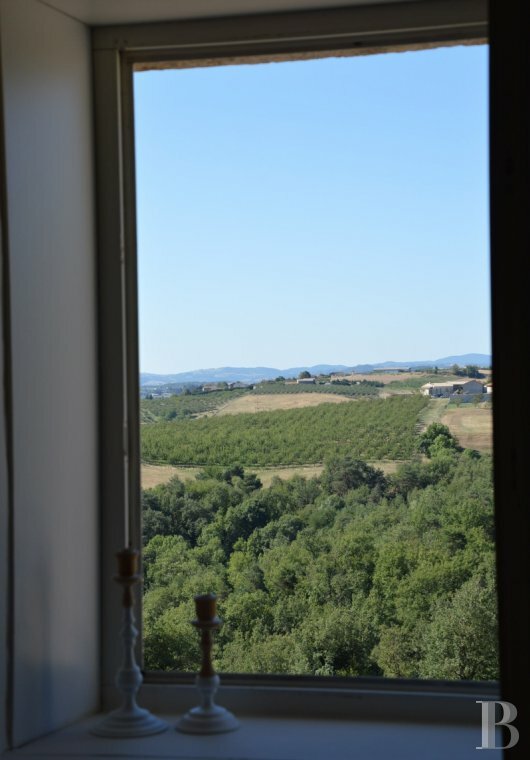 A panoramic view takes in the still wild surroundings. 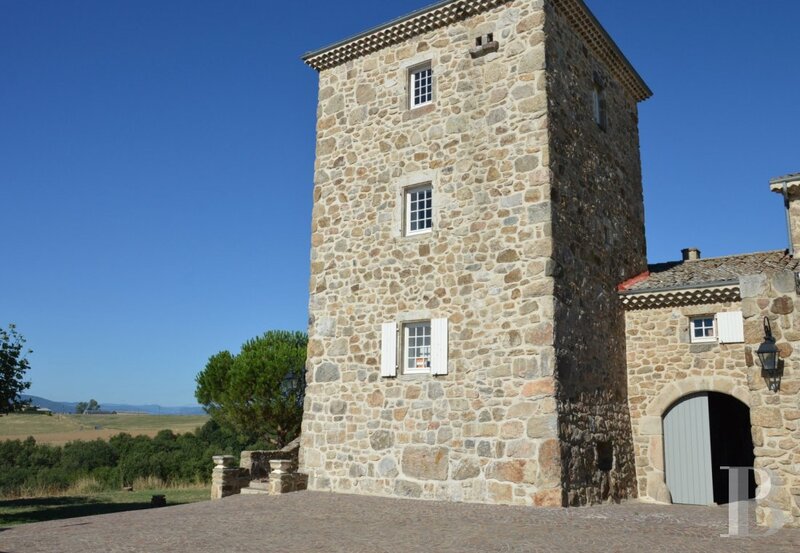 This square tower is entirely built of stone. 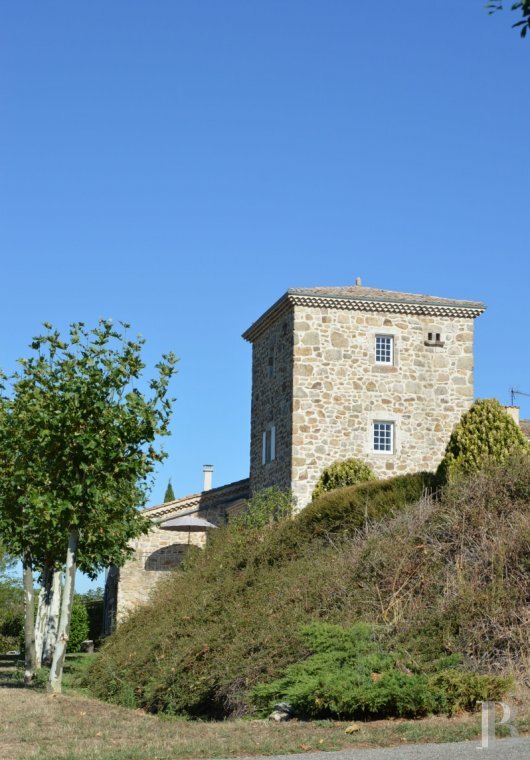 It spans four levels and is topped with a hip roof covered with Roman tiles. The windows are filled with small-panes. A south-facing terrace, paved with small tiles, provides a panoramic view. 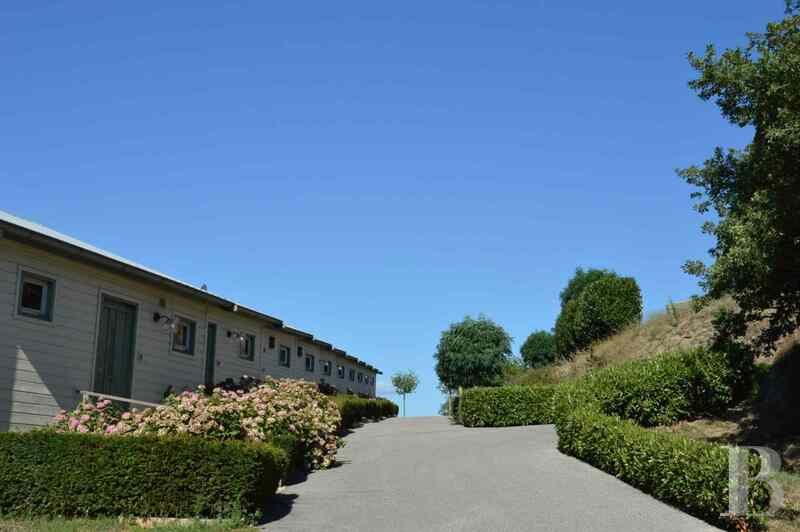 A series of bungalows stands on a lower level, in the direction of the swimming pool. 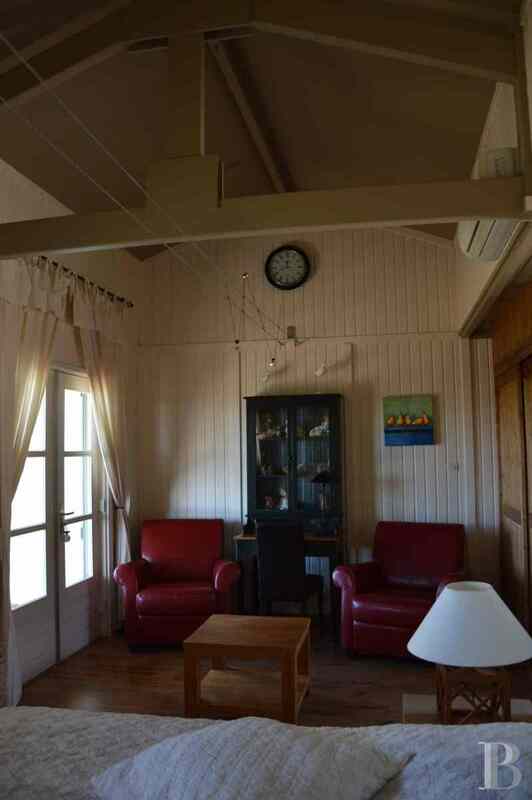 These small wooden constructions also have a south-facing covered terrace. 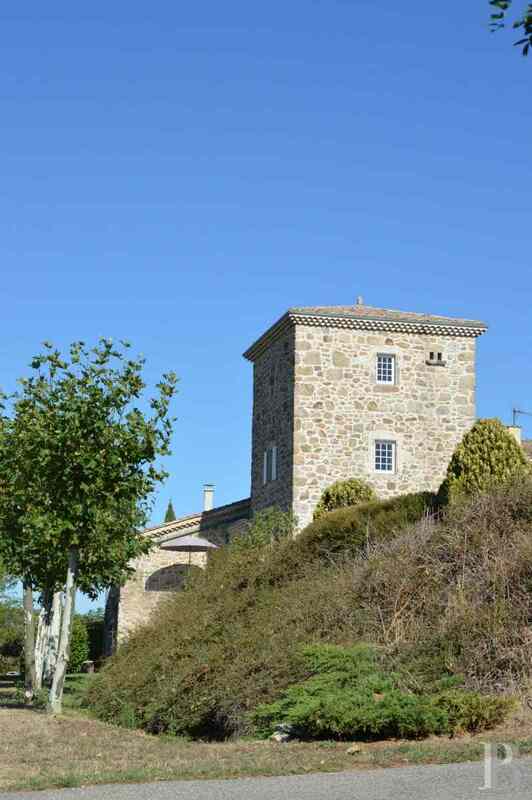 One of them comes with the tower, together with a horse loose box in one of the co-owned buildings which houses a riding arena. This horse loose box could, of course, be used for storage purposes. A superb outside stone stairway goes up to the first level of the tower. 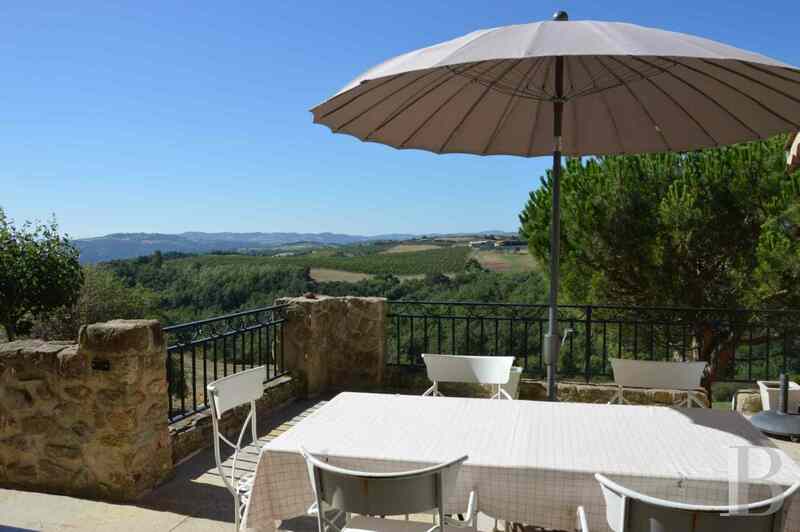 A wide terrace, stretching out in front of the entrance, provides an unobstructed view over the surrounding hills, typical of the Ardèche. The front door is set under a wide stone archway. A stairway, housed in the hall, goes down to a lower level of the tower. A few steps go up to the lounge. 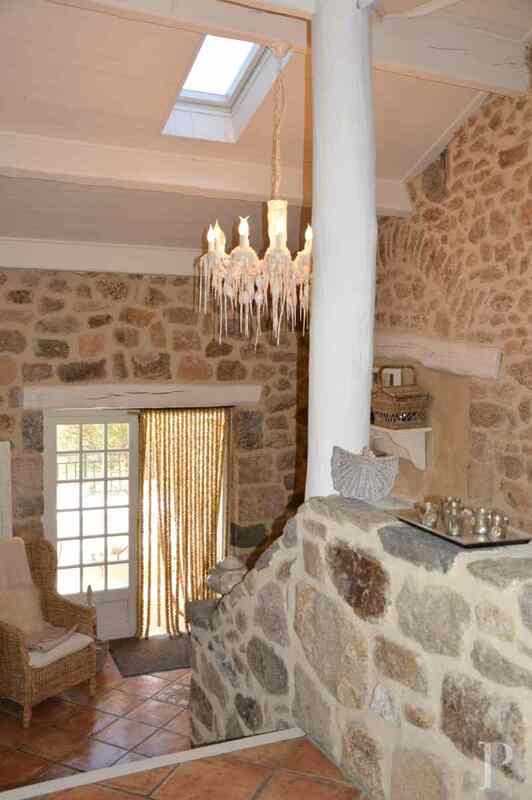 The walls are constructed from exposed stone and the ceilings have exposed, white-painted beams. This convivial lounge features a Godin wood-burning stove. It communicates with a spacious, fully fitted kitchen. A stairway goes to the floor above. 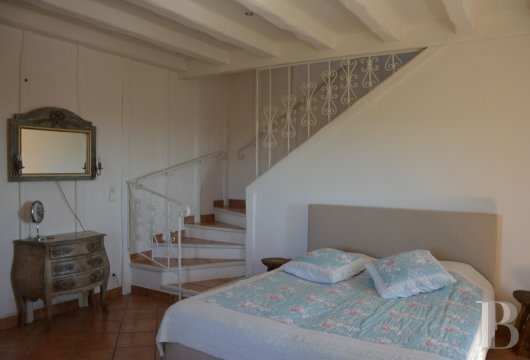 The stairway comes out on the second floor in a luminous bedroom. Once again the ceiling has exposed, white-painted beams whilst the floor is covered with tiles reflecting ochre hues. Large cupboards forming an alcove flank the south-facing window which lets in bright rays of sunlight. A stairway adorned with wrought iron railings goes up to the top floor of the tower. The bathroom on the third floor is spacious. It has a superb bath with lion-claw feet and a wide Italian-style shower. Both wash-hand basins are set on the marble top of a long, old cupboard, providing a lot of storage space. The toilet is separate. This level also includes a dressing room and a small room, containing bunk beds. The stairway in the entrance hall goes down to the lower level of the tower. 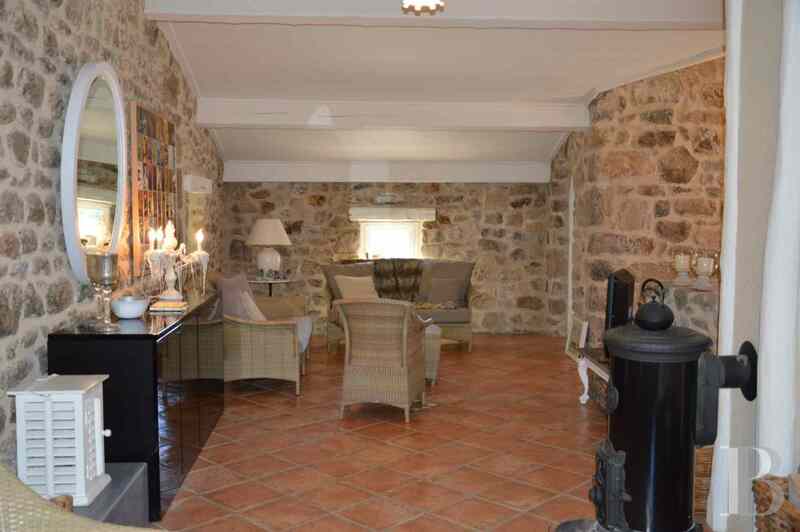 A door, level with a mezzanine, acts as another entrance to the residence via a covered porch way adjoining the tower. Said porch way leads to a small shady patio and directly outside. The stairway ends in a small corridor where there are a toilet and a storage room. 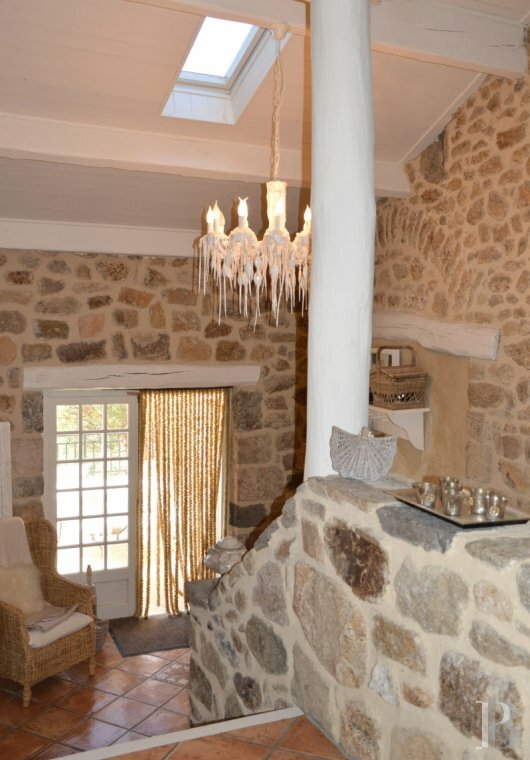 This level features stone floor tiles and walls covered with old fashioned whitewash. The corridor leads to a bedroom which has a shower room and cupboards with old wooden doors. This level therefore comprises a suite which is independent from the rest of the house. 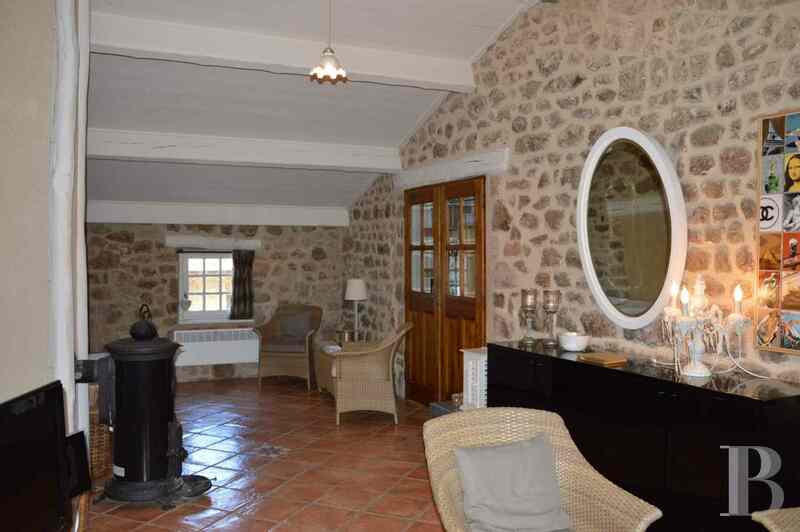 This property also comprises a wooden bungalow and a horse loose box. The bungalow stands, with the others, along an alleyway on the estate. 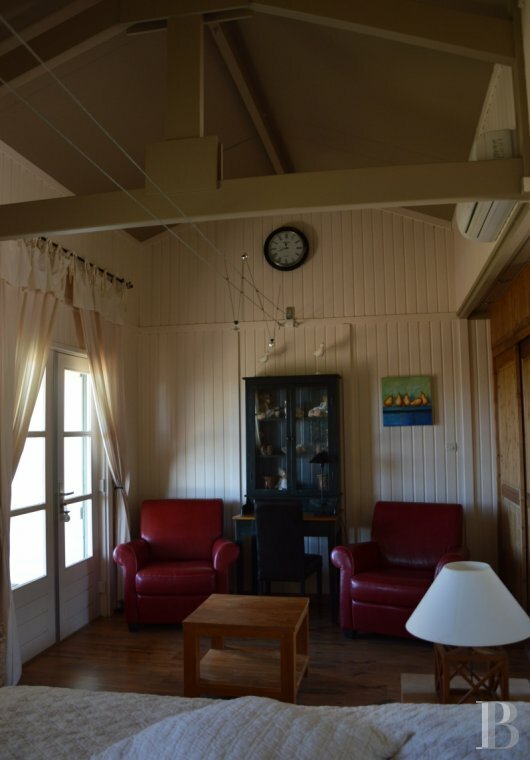 This small wooden house comprises a suite consisting of a bedroom, a lounge area, a shower room and a toilet. 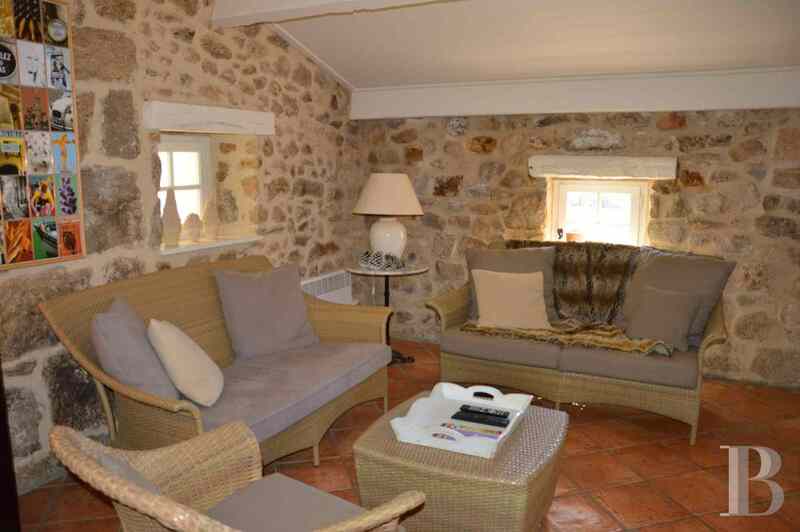 The lounge area opens via a wide picture window on to a covered, south-facing terrace. It has a panoramic view. One of the estate’s buildings houses a riding arena as well as a loose box, simply waiting to accommodate its horse. It could also be used as storage space. 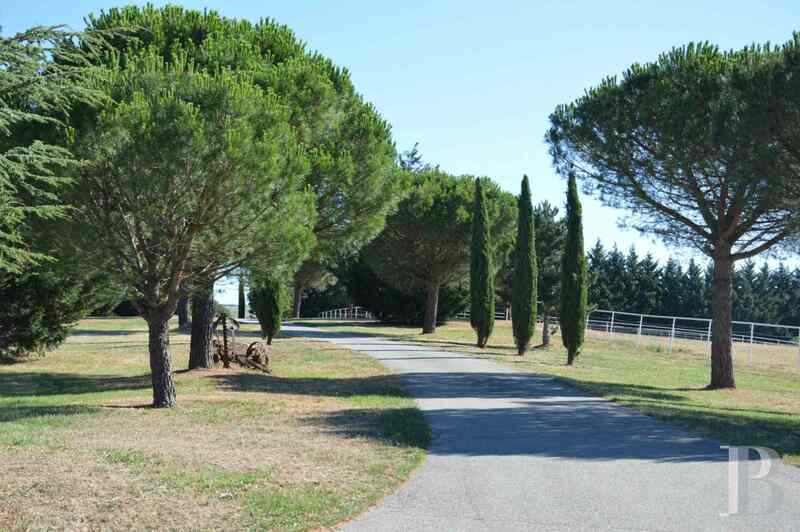 This estate, set at the end of a little lane passing through countryside typical of the Ardèche, extends over approx. 3.7 ha. 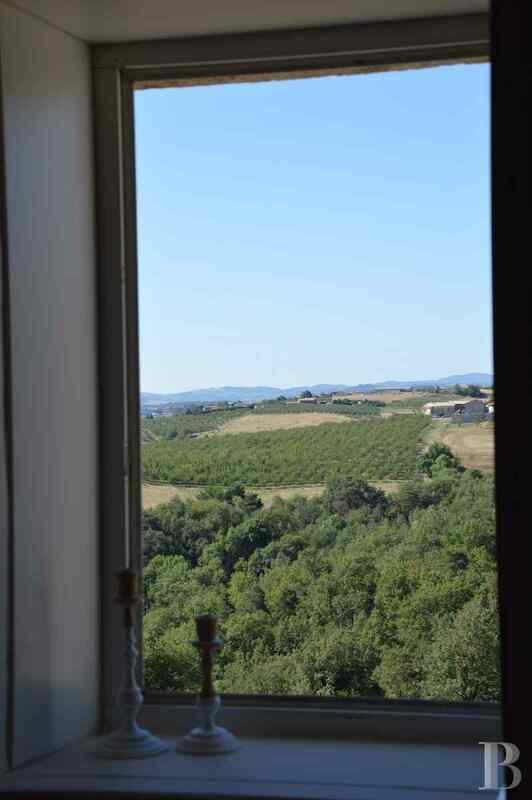 In a dominant position, it has an exceptional panoramic view. In the midst of umbrella pines and Florence cypress trees stand some superb, renovated stone constructions, exuding their strong, authentic character. A few meadows contain horses and contribute to a feeling of peace and serenity. 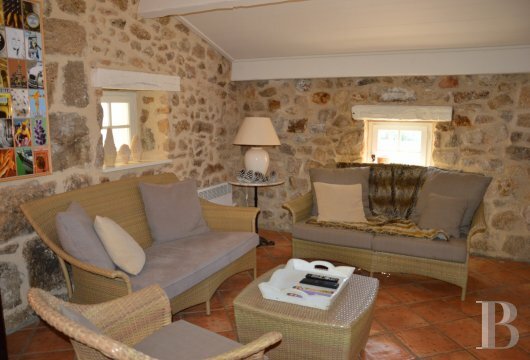 The houses, in an old 18th century building, have been cleverly converted in order to provide each of the six residents with their own privacy. The swimming pool has been installed below the houses, out of sight of onlookers, in a slightly undulating section of the grounds. A wide paved terrace flanks the pool and its pool-house. 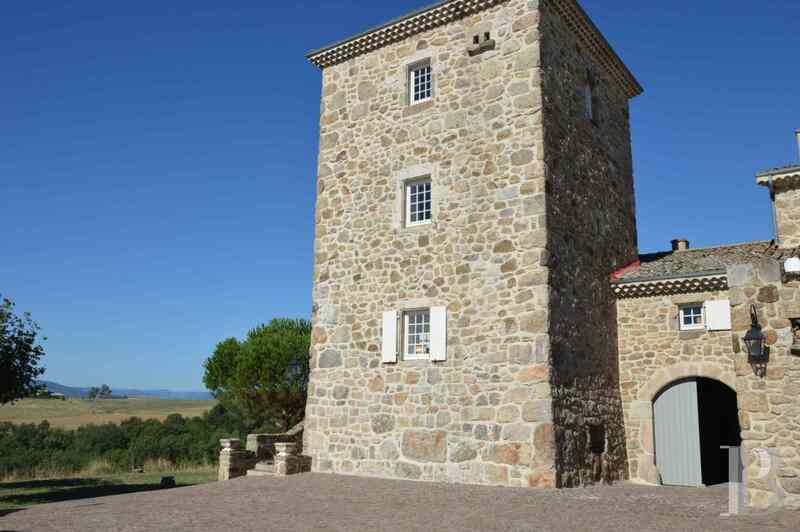 The ambitious conversion of this old 18th century tower has proved extremely successful. The building, renovated using first-class materials, has lost none of its elegance and gained in appeal courtesy of a good measure of fantasy. The estate is harmonious and tranquil. Newcomers will have use of the swimming pool without having to be responsible for its upkeep. 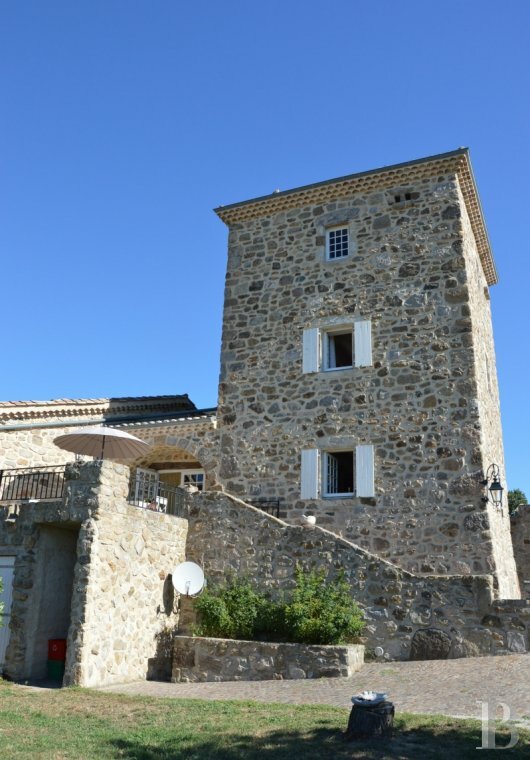 They can make the tower a holiday home unless they are attracted to the idea of living peacefully all year round in the heart of a wild, authentic Ardèche.